Riding the warm thermal currents of the air is perhaps the closest man has ever come to sailing Para-Gliding the skies as free as a bird. Almost at will, you dip and wheel high over the hills and valleys. 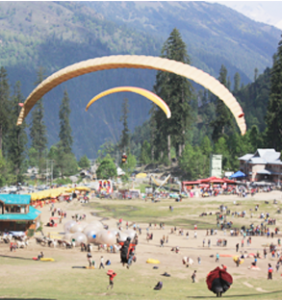 Bir-Billing in Kangra district of Himachal Pradesh is one of the best paragliding site. para-gliding is also possible at other places in the state. 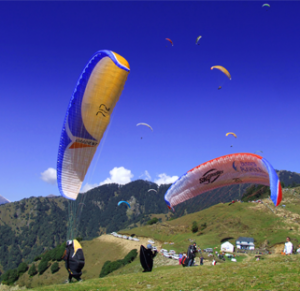 Places where para-gliding is done are Bundla Dhar near Bilaspur, Solang valley near Manali in the Kullu district. Himachal Tourism sponsors training programmes and events at various times of the year, in different places. There is an Adventure Sports Hostel at Dharamsala (Kangra) and an Aero Sports Complex at Bir. For details of training facilities, contact sports associations or District Tourism Development Office at Dharamsala. Ph: 01892-224430. Triund is an alpine meadow situated on top of a ridge from where we have superb view of the peaks of Dhauladhar mountain on one side and Kangra valley on the other. 18 Km from Dharamshala, and 9 Kms Trek from Mecleod ganj, Triund lies at the feet of the perpetually snow clad Dhauladhar at the height of 2,975 m. The snow line starts at Ilaqa (3,350 m), 5 Km from Triund. It is a popular picnic and trekking spot. 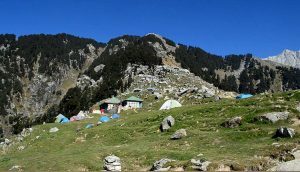 The tracks from Rawa, Dal Lake, Dharamkot and Bhagsunag meet at a ridge known as Galu temple (2,130 m) which has a small shrine and water point. On the way one can spot many birds and wild animals. Accommodation is available in the rest house of Forest Department, but water has to be fetched from a distance of about 2 Km. Route guidance, maps, equipments on nominal rent etc. may be had from the Regional Mountaineering Centre, Mcleodganj. Trekking starts from Dharamkot towards Triund. Triund trekking trail is steep gradient and takes around 4 hours of trekking through dense forest of Rhododendron(Gurans) and Bann. One can see beautiful views of Dhauladhar range and Kangra valley from Triund meadow and then further small trek from Triund hill to Laka Got. One can stay overnight in Laka as it is important for acclimatization for further moving ahead for the steep rise in altitude. Next early morning one can start for the Indrahar Pass Trek. From the Indrahar Pass one can have the amazing views of majestic peaks of Pir Panjal range of central Himalayas. After crossing the Indrahar Pass the trekking route is a steep descent till Chatta Paroa, and then one can proceed via Mandara to reach the beautiful village of Kuwarsi which is at a height of 2730 meters and then further towards Lamu and then Choli village road ahead and from there one can drive to Chamba Town. Rajgundha, often referred to as the heart of valleys in Northern India. This valley is situated under the foothills of Dhauladhar mountain ranges and consists of very high snow mountains. The top of the hill is approx. 2400 meters high from sea level. Reaching at the top gives you the best view around to quite a long distance. This valley is well known for trekking, camping and angling. Also, it is a place where you can experience true nature and the wildlife. The valley we are talking about is blessed with life where one can feel abundance of positive energy. The lush green trekking trails, the cool mountain currents and sky touching hills encapsulating the entire vista just make your day giving you a break from the hush-rush, monotonous routine. It is one of the most preferred trekking routes for tourists because of its scenic beauty and tranquility. Trekking in Rajgundha is over 16 kilometers long that connects two road heads and can be covered in a day or two. The trekking experience offers snapshots of the village lifestyle, nature, wild life, and local culture. Not only this, tourists love carrying out adventurous activities like camping and angling. RajGundha & KukarGundha are twin villages bestowed with beautiful environment. Both the villages are well-connected with other nearby rural communities. However, there is not much developed and hence the villages still do not have well-laid road network and transportation facilities. Rajgundha and Kukargundha offer amazing views and the loveable aroma all around the valley. This mesmerizing valley is the home to birds and wildlife. Here the cabbage and potato crop is grown in abundance. While the region is quite a place to live, it gets extreme cold in winters. Hence, villagers move to lower places in winters with their cattle and livestock to save them from snow and cold. The houses here are another fascination for the visitors. 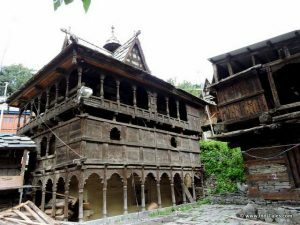 They are built in old traditional way using stone and mud.